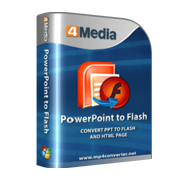 The PowerPoint to Flash conversion specialist, 4Media PowerPoint to Flash can convert all your PowerPoint presentations (PPTs) to Flash quickly and easily. This PPT to Flash converter can also help you create custom Flash presentations. Custom-made PowerPoint to Flash converter to help you convert PPTs to Flash files. 4Media PowerPoint to Flash is capable of converting any PPT to Flash in an instant while keeping all original slide features. 4Media PowerPoint to Flash runs as an add-in in PowerPoint and will appear as a tab menu on the main Ribbon toolbar once installed. Creating a customized Flash presentation is easy with 4Media PowerPoint to Flash: prepare your slides in PowerPoint; add your own text, logo and photo; adjust the animation, playback and audio settings; set the slide transition interval, and off you go! You can also convert a PPT to a single simple Flash presentation or an interactive multi-file Flash presentation with your personalized information included. 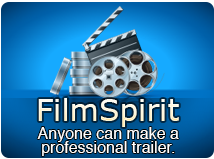 Quickly and easily convert PPTs to Flash while reserving all original slide features such as animations and effects. This PPT to Flash converter allows you to add your own personalized information, logo and photo to your Flash presentation. Convert a PPT to Flash directly without additional features; convert a PPT to Flash with interactive features and your own information incorporated. Set a range of output parameters (image quality, audio sample rate, audio bit rate, frame rate etc.) to create fully customized Flash presentations. You can also set the slide playback interval. Freely set how your animations and slides are played in the output Flash presentation using this smart PPT to flash converter. Set a password to your presentation to prevent it from unauthorized use. You will be prompted to enter it every time you run the Flash presentation. Play or pause the slideshow, add marks to slides, view or print any slide, take print screens, access presentation notes and attachments at any time during playback. 4Media PowerPoint to Flash enables you to freely set the frame size of your presentation to suit you. User-friendly interface available in several languages: English, German, French, Spanish, Japanese, Simplified and Traditional Chinese.